Unisphere is web-enabled software for remote management of storage environment. It has all the extras, like widgets and sortable tables, wizards etc. Unisphere Management Server runs on the Storage Processor (SP) and the Control Station. To launch a Unisphere you can fire up an Internet browser and type the IP address of either one of the SPs or the Control Station. How to login for fist time? 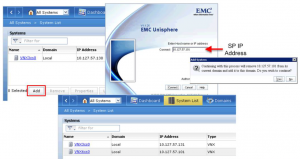 Administration of VNX is performed with the Unisphere graphical user interface (GUI). Administration of the VNX system can also be performed with a command line interface (CLI). File enabled VNX systems use a command line interface to the Control Station for file administrative tasks. Block enabled systems have a host-based Secure CLI software option available for block administrative tasks. The CLI can be used to automate management functions through shell scripts and batch files. The VNX provides three different administrative user auth scopes. * Global authentication scope is used when the VNX is configured to be a member of a Storage Domain. All the systems within the domain can be administrated using a single sign-on with a global account. * Local authentication scope is used to manage a specific system only. Logging into a system using a local user account is recommended when there are a large number of systems in the domain. 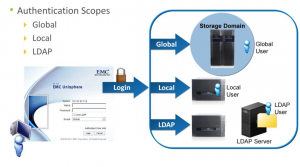 * LDAP authentication scope is used when the VNX is configured to “bind” to an LDAP domain. The VNX performs an LDAP query to the domain to authenticate the administrative users. A VNX system can be manager using a Unisphere session to any member of the Storage Domain. The system also includes a default “sysadmin” Global user account in the Domain, which is configured with the Administrator role. To add a VNX system into an existing VNX local domain, in Unisphere navigate to the System List, and perform Add operation. 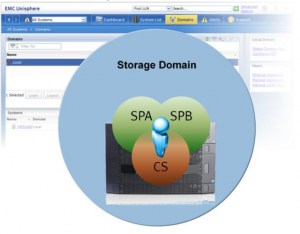 You have to provide an SP (Storage Processor) IP address of the VNX system to be added. When adding a system into the domain, the system being added will be removed from any of its existing domain configurations. Obviously you will also be asked for credentials to login to the VNX system being added. Once the VNX system is added, it will be displayed in the System List page. I am a new geek to storage technology. Its found very simple and nice to read Article given in this portal. Thanks to the team!!!!!! I am trying to log into the VNX5300-Block SPA and SPB using the Service Port connected to my laptop IP 128.221.1.249; I cannot connect to SPA 128.221.1.250 but can connect to SPB 128.221.1.251; I accepted the Certificate and get to the login screen asking for the Name & Password; what is the default to use here? I am connecting through the Unisphere Service Manager. “this operation is not supported. this function may not yet be implemented” next to the OLD Service password box and the admin password does not update. However when I SSH into the service account it’s using the new password I tried setting. Is there a way to create a new global admin in SSH so that I can login to Unisphere using that account? I’m seriously at a loss right now.